As planned Apple has opened up iTunes donations to the Southern Poverty Law Center, part of a broader reaction to the violence at this month's far-right rally in Charlottesville, Va. 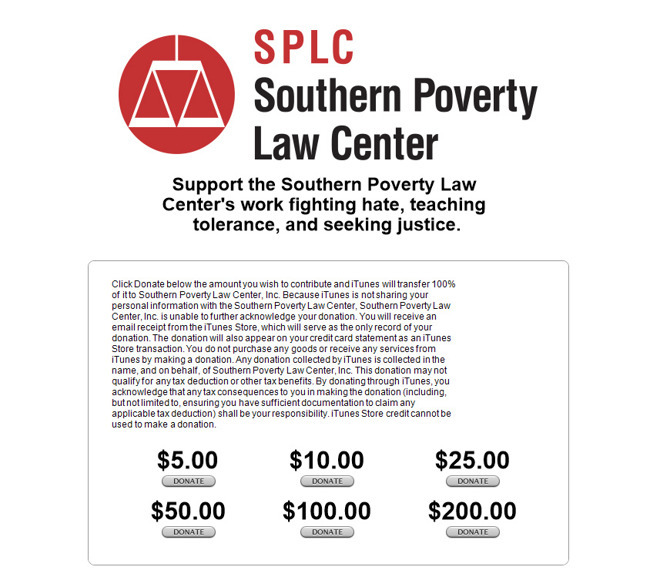 The company is enabling donations in increments of $5, $10, $25, $50, $100, or $200, and promising to transfer the whole amount to the SPLC. Links to donation pages can be found in both the iOS and desktop versions of the iTunes Store. CEO Tim Cook signalled the measure in an August 16 letter to workers, criticizing not just neo-Nazis and other white supremacists present at the rally but U.S. President Donald Trump's public statements afterward, which drew a moral equivalence between the rally's opposing sides. One counter-protester was killed and many other people were injured. Apple will also be making direct $1 million donations to the SPLC and the Anti-Defamation League, and matching employee donations to various human rights groups on a two-to-one basis until Sept. 30. The company has further disabled Apple Pay on sites selling Nazi or white nationalist products. Apple claims a small fee from each Apple Pay transaction.